A Blackburn Rovers fan has been fined £1,000 and banned from football grounds for five years for racially abusing Birmingham City player Dwight Yorke. Jason Perryman, 22, from Lawson Street in Chorley, admitted a racially aggravated public order offence before Blackburn magistrates on Wednesday. Yorke said he had faced taunts during Sunday's game between the clubs. Perryman was told by a magistrate he had "racially humiliated" Yorke and there was no place for such behaviour. Another man charged in connection with an alleged incident denied the charge and his case was adjourned. David Ashcroft, 21, of Brantwood Drive, Leyland was bailed to 22 December. John Fryer, chairman of the bench, told Perryman: "You racially humiliated Dwight Yorke in public by both actions as well as words. "There is no place in football or anywhere else for racist behaviour." Yorke was upset and had confronted Perryman over the monkey chants and gestures, telling him he was "out of order", the court heard. Perryman was then ejected from the ground by stewards. Michael Singleton, defending, said the defendant had been drinking before the match and was now ashamed of his behaviour. "During the course of the game, it became apparent there were taunts being directed towards Dwight Yorke," Mr Singleton said. "Those taunts seemed to relate to Mr Yorke's energetic lifestyle in direct proportion to the energy expended as a Blackburn Rovers player whilst playing for them. "Those taunts were for the most part relatively light-hearted. "Mr Perryman accepts he took matters further and beyond that which was taking place into realms that were totally unacceptable." The defendant became aware of a nationwide appeal the next day and went to police when he was shown a videotape of the incident. "Mr Perryman was appalled by what he saw. 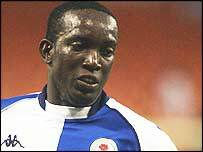 It's his intention as well as to publicly apologise to Dwight Yorke and Blackburn Rovers, to write personally to Mr Yorke and the chief executive of Blackburn Rovers," Mr Singleton added. David Macro, prosecuting, said Yorke had expected some "jibes" but, while warming up on the touch line, became aware of the racist taunts. "Mr Perryman was seen to be gesturing towards Mr Yorke, gesturing imitating a monkey using his arms moving up and down in that fashion to his armpits. "At the same time, he is making 'ooh ooh ooh' monkey noises. Mr Yorke was clearly upset," Mr Macro told the court. "He went over and said to them: 'That's out of order. You should not be doing that. Stop'. "It's made all the more worse in light of recent events of the England and Spain football match."